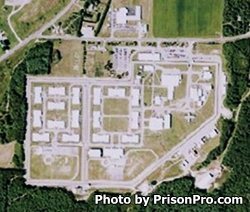 Franklin Correctional Facility is located in Malone New York. It is a medium custody prison that houses adult males. The current capacity of Franklin Correctional Facility is 1,730 inmates. This prison participates in the Correctional Industries program allowing inmates to work in a garment shop. Offenders can also receive drug and alcohol abuse treatment during their incarceration. Franklin Correctional Facility offers vocational training in masonry, welding, horticulture, business, floorings, building and custodial maintenance, computers, and electrical. A waste management program at this facility processes and separates the waste of the facility recycling and composting whatever possible, and saving the facility thousands each year in waste costs.